During high season, guests at the Hotel Schmiedhof receive a special bonus with the AlmencardPLUS: For the duration of your holiday, you will get the AlmencardPLUS free of charge! This advantage card has it all. You can enjoy a relaxing vacation in South Tyrol without a car and take advantage of a great package of benefits and interesting offers. The services of the AlmencardPLUS include unlimited rides on the cable cars Gitschberg, Val Giovo, the funicular Rio di Pusteria-Maranza and the bus from Rio di Pusteria to the Alpe di Rodengo. Please note that the gondola from Maranza to Mount Gitschberg is inoperative between mid-October and early December. 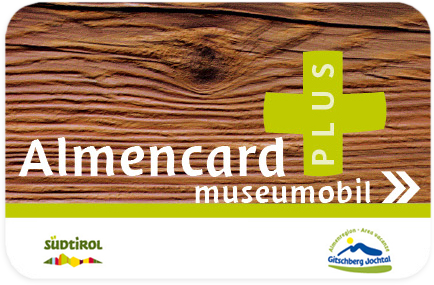 Enjoy free admission to more than 80 museums in South Tyrol with the AlmencardPLUS. In addition, it offers you discounts in many shops and leisure facilities. With great offers for children, the AlmencardPLUS is the perfect companion for your family vacation. Discover the fabulous weekly programme, which is free of charge for you and your children: Summit tour to the panoramic platform on Mount Gitschberg +++ Farm tour in the Fundres Valley +++ Bee Stories – everything about honey & bees +++ Kneipp Hike in the Altafossa Valley +++ Tales of our village … “brave farmers, beautiful heroines, dark bunkers” +++ Historical & cultural tour to the Mühlbacher Klause +++ Sunrise hike at 2,000 m in Valles +++ Hike through the Golden Fall (mid-September) +++ “Krixly Kraxly” – climbing course for children aged 5 to 9 years in Valles +++ “Kletterhetz” climbing course for children from 10 to 14 years +++ Old Castle and New Wine: visit to an organic farm with tasting +++ Jousting for children at the Mühlbacher Klause +++ Carriage ride for children in Maranza. In addition, for only two € per day, you may use the adventure pool “Alpinpool” in Maranza with the AlmencardPLUS.